Great shoes, able to accommodate my wide feet. Outstanding build quality. Great for spin classes - great fit for wide feet. Good looking, comfortable shoe. Order one EU size larger than you would wear in trainers as they fit quite snug. Great shoes for both road and spinning. Great shoes for a recreational cyclist or beginner, reasonably light and stiff. I am a size UK 8.5 so it was either the 43 or 44, as recomended I went up a size and they fit perfectly. Keep in mind its a hard toe shoe so there is no stretch in the toe of the shoe . Ordered online, great communication and swift delivery. 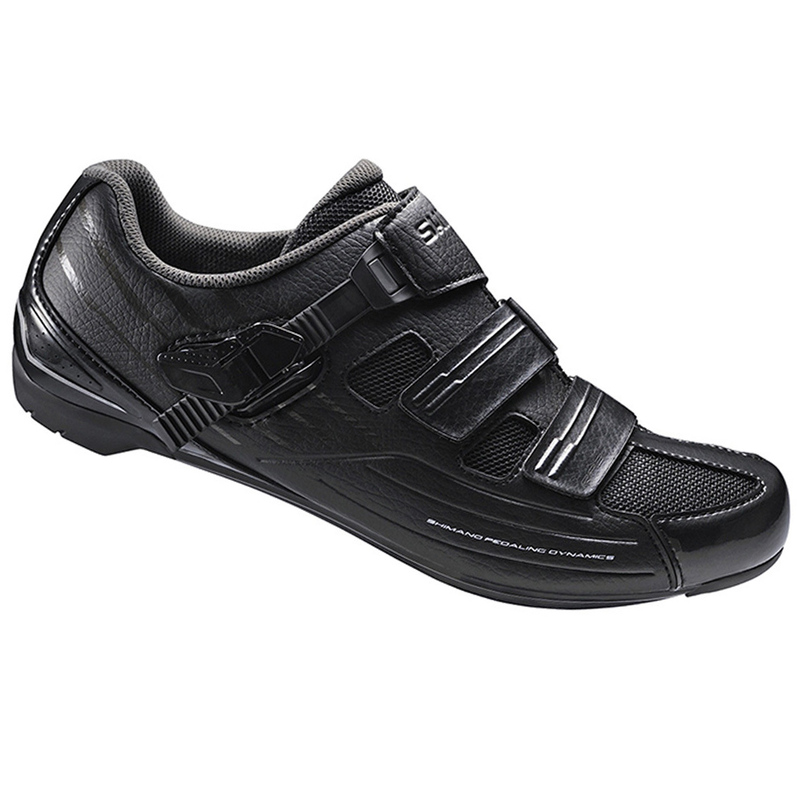 These Shimano shoes offer excellent value for money, are very comfortable and an ideal winter shoe. I was looking for black as far more practical for the Autumn / Winter. 100% recommend them as this is my second pair of these shoes, would also happily recommend Merlin Cycles to fellow riders. Excellent quality and best price around. Ordered EU 44 for 9.5 UK size. Perfect and very comfortable fit. Excellent quality and very reasonably priced shoes. Ordered EU 44 for 9.5 UK size. Perfect and comfortable fit. Shoe fit was close to true to size - I normally wear a 9 or 9.5US and went up to the 44 which was slightly large. Have only been on a couple of medium length rides but have been very comfortable so far. Love the red colour, although they do seem to attract a few grease marks. Brilliant shoes, very comfortable and easy to adjust. A little on the small side but still fit well. It's 5000 yen less expensive than a Japanese value. Japanese people should purchase eurosize larger than ordinary shoes. We recommend size up. I usually 43 (US 9 - 9.5) (27.0 cm 3 E) 43 is just fit, 44 seems to be good. It seems that even a long ride can be used. Japanese people should purchase eurosize larger than ordinary shoes. We recommend size up. I usually 43 (US 9 - 9.5) (27.0 cm 3 E) 43 is just fit, 44 seems to be good. It seems that even a long ride can be used. Fits true to size, excellent quality, and great value. These road shoes have the comfort of trainers. They are very easy on and quickly fastened with the ratchet system (I leave the two velcro straps fastened at all times). I specifically searched for a wide fitting shoe and based on the description and previous reviews these have been excellent. I have enough room for comfort, the sizing is as expected for normal shoes.The styling, ergonomics, and cost all make this a fantastic product and highly recommended. Good value for these shoes. Definitely for those more narrow-footed people out there. Despite the low price point and place in the shimano RP line up, these are a great fit. They more than hold their own against my RP9's. I went with the same sizing in both RP3 and RP9. Snug fit compared to other Shimano size 43`s. Up to the usual Shimano standard though. First rate delivery service from Merlin. Beautiful cycling shoes & practical, since the bright red color stands out when you ride on roads full of cars whose drivers are not exactly happy about sharing the road. Couldn't resist buying another pair of these shoes in the Merlin sale. Most comfortable shoe I've had (and I've had a few!) Knew the 47 size would be a perfect fit for my size 11's. Ok, not the stylish looks of my other well known Italian brand shoe but so much more comfortable, and the new red colour looks a treat. Great fit and look! Really happy with the product overall! Only worn them 5 or 6 times short 6 mile commute to work and one longer ride. Just the job for my level of riding. Get a size up from your normal shoe size. I'm normally a 45 but 46 shoe is snug fit. if you are going to use SPD cleats, like me, you will need a set of inexpensive cleat adapters. Really pleased with these shoes. I have found with Shimano shoes I need to buy at least one size larger; I normally take 45 and the ones I bought were 47 wide fit and they are just right. They are really good shoes, very high quality.